Many people suffer with fungal nail infections both in the fingernails and toenails; they are one of the most common conditions podiatrists have to treat. They can be embarrassing to live with, but as well as being unsightly it can also be painful. There are a lot of suggested treatments for toenail fungus but none of them are truly fast. Most treatments, oral or topical, home remedy, medicated or over the counter take some dedication to follow, can go on for months, and may prove ineffective anyway. So, when you are looking at how to get rid of nail fungus fast, if money is not a problem your best option is laser treatment. One of the places you can get fungal toenail laser treatment is Laser Nail Centre. Laser treatment can target the fungal infection in both finger and toe nails without damaging the surrounding skin and the nail itself. A session is usually around half an hour, and the amount of sessions needed depends on how severe and how many nails are affected. If you have a mild problem one session may be all that is needed, if it is severe you might require several sessions. In the small studies that have been done laser treatment comes out with a much higher success rate than other treatments, and you can certainly get rid of nail fungus fast. There are no drugs involved so no need to worry about serious side effects that can have a large impact on your overall health. As well as requiring a lot less time in terms of treatment, using laser also means you do not have to make regular visits to a doctor to be monitored for side effects, another way it helps get rid of nail fungus fast. There have not been large studies done on this form of treatment yet, and because it is relatively new there is no data on long term effects. However the studies that have been done on a small scale have had no side effects, no damage to the nail or skin is caused and patients have experienced no discomfort during treatment. Success rate of a cure is around 80%. There are several laser nail centres around the U.S.A and they have a website where you can put in your town and find the nearest one to you. Sessions involve using a narrow range of light in a focused beam shone on the infected nails. It penetrates the nail without damaging it and targets the fungus beneath it. It is more effective then topical treatments because the nail does not act as a barrier. The frequency of the laser affects just the fungus cells and not your skin or nail. It causes no pain or discomfort and sessions can last from 10 minutes to half an hour depending on severity. Most patients only need one session but some need one or two more. A fully healthy nail can take 6 months to grow through for finger nails, and 9 to 12 months for toenails. Often your doctor may suggest an anti-fungal cream as a follow up treatment to be completely sure and this can also help speed up the process of a healthy nail growing through. 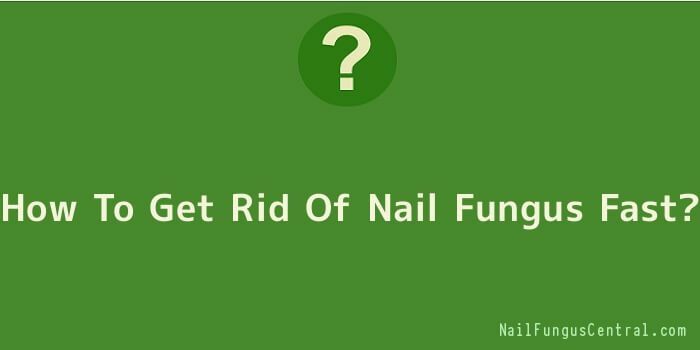 As mentioned this is how to get rid of nail fungus fast if you have the money to do so. Laser treatments range in cost depending on how severe your infection is, where it is and so on. You can get in contact with your local centre to ask for price quotes, but expect it to be in the hundreds of dollars, and if you need long or several treatments, in the thousands. This is not covered by health insurance. The Laser Nail Centre do not charge, however, for the initial consultation.